Proliferative therapy (Prolotherapy) is the process whereby dextrose, P25G or sodium morrhuate is injected into ligaments in order to produce a proliferating response of that ligament. The purpose of these injections is to strengthen ligamentous structures and relieve pain. A review of the literature is provided and a retrospective study presented which demonstrates a 66% redction of sacroiliac low back pain in two-thirds of the patients who received this form of treatment. Key Words: Prolotherapy, Sclerotherapy, Low Back Pain, Sacroiliac pain. Ligaments consist of many strands of fibrous tissue which may run parallel or crisscross at various angles to each other. They provide stabilization of joints in all positions. Pain occurs when normal tension on a ligament stretches the fibers. This results in stimulation of the sensory fibers which do not stretch along with the ligament1. In sprain or tearing, the fibers become separated from bone, and tthere is an accumulation of lymphy or blood at the site of injury. Healing occurs through initiation of the wound response cascade mediated by chemotactic agents and inflammatory cells. Fibrin is produced and develops into a permanent strong fibrous tissue attached to bone. The rich supply of nerve endings in articular ligaments was first described by Lerich in 1930 and later by Gardner in 1953. Hackett described most joint pain as ligament pain. He was the first to scientifically demonstrate a method of strengthening ligaments by the injection of a proliferative solution. Inflammation was produced and a permanent increase in ligament size by 35-40% resulted. In 1987, a double-blind study was done by Ongley et al. comparing 40 patients who received spinal manipulation and ligament strengthening proliferative therapy with 41 patients who received minor manipulations and 0.9% saline injections. One injection per week was done for 6 weeks. The solution used was 2.5%phenal/25% dextrose/25% glycerin/47.5% pyrogen free water (P25G). The effects of prolotherapy on 43 patients with chronic sacroiliac strain were retrospectively reviewed. There were no sciatic tension signs, motor weakness, sensory deficits, or patients with bone abnormalities entered into the study. The patients had all failed to respond to other forms of treatment including surgery. Ages ranged from 20 to 70 years. 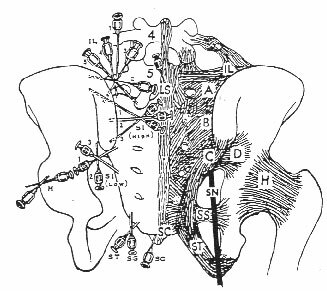 Treatment consisted of three injections into the insertion of the posterior sacroiliac ligament, beginning at its most caudal one-third and moving superiorly by one-third of its length with each injection (figure 1.) The injections were done 2 weeks apart. The proliferant used was a mixture of 1 cc of 5% sodium morrhuate and 1 cc of 1% Xylocaine. A needle of proper length was used that assured the proliferant was placed on bone. The solution was distributed throughout the fibro-osseous junction. Each patient was informed that there would be a 2- to 3- day period of discomfort in the area of the injection due to the initiation of the wound-healing cascade. Instructions were given to avoid aspirin, ibuprofen, or other prostaglandin inhibitors, and to use only acetaminophen to relieve pain. Activity was encouraged. The patients were instructed in sacroiliac mobilization exercises and fitted with a sacroiliac belt. Each patient was seen on 2-week follow-up after the third injection. Subjective percentages of relief were recorded. If satisfactory pain relief had been obtained, they were discharged from treatment and instructed to return on an as-needed basis. At the conclusion of the three injection series, on 2-week follow-up, 20/43 patients reported 95% improvement, 31/43 75% or better improvement, and 35/43 reported 66% or better improvement. Thus, 2/3 of the patients received 66% relief. No improvement was reported by 3/43. While no formal mechanism for prolonged follow-up was in place 10/40 or 25% reported some level of recurrence (Table 1). Table 1. Relief obtained in 43 patients after a series of prolotherapy injections (three injections, once every other week). The sacroiliac joint can be considered to be unstable when the ligaments are relaxed. Because of this joint’s weight-bearing spinal mechancis the ligaments supporting it frequently become damaged. This can lead to intense pain, which may become chronic. It can result in abnormal compensatory movement as well. The altered spinal kinesiology can lead to further injury of other structures such as lumbar vertbrae, sacrum, and intervertebral disks. Prolotherapy is designed to strengthen the sacroiliac ligaments so as to develop normal tension in them. Numbing of the ligament with Xylocaine and obtaining immediate relief provides for temporary comfort from the injection. The ensuing painful reaction that occurs from the proliferative injection represents the activity of the initiated wound-healing response. Prostaglandin inhibiting medications should be avoided. Figure 1. Needle Location used for injection of the sacroiiac ligaments. We conclude from this study and the aforementioned literature that it is possible to induce proliferation of collagen in human ligaments using prolotherapy. The tissue that proliferates is a dense collagen and is associated with a reduction in pain. Mechanical back pain can be relieved by this method and other compensatory injuries prevented. Cyriax J. Textbook of orthopaedic medicine. Philadelphia: Bailliere Tindall, 1982. Onlgey MJ, Klein RG, Dorman TA, Eek BC, Hubert LJ. A New Approach to the Treatment of Chronic Low Back Pain. Lancet. 1989; 11:143-146. Klein RG, Dorman TA Johnson CE. Proliferant injections for low back pain: histological changes of injected ligaments and objective measurements of lumbar spine mobility before and after reatment. J Neurol Orthop Med Surg. 1989; 10:123-126. Injection therapy helps low back pain, study reveals. Back Pain Monitor. 1988; 6:12:161-172. Gearhardt JJ. Interdisciplnary rehabilitation in trauma. Baltimore, Md: Williams and Wilkins, 1987. Mirman MJ. Sclerotherapy. Springfield, PA, 1986. Leedy RF. Basic techniques of sclerotherapy. Osteop Med. 1987;9. Liu YK, Tipton CM, Matthes RD, An in situ study of the influence of a sclerosing solution in rabbit medial collateral ligaments and its junction strength. Connect Tissue Res. 1983; 11:95-102. Maynard JA, Pedrini VA, Pedrini-Mille A, Romanus B, Ohlerking F. Morphological and biochemical effects of sodium morrhuate on tendons. J Orthop Res. 1985;3:236-248. Wyngarden JB. Cecil textbook of medicine. Philadelphia;W.B. Saunders, 1988. Robbins SL, Kumar V. Basic pathology, 4th ed. Philadelphia: W.B. Saunders, 1987. Banks A. Biochemical effects of prolotherapy. First Annual High Country Prolotherapy Workshop, Denver, Co., 1989. Hunt WE, Baird WC. Complications following injections of sclerosing agent to precipate fibro-osseouis proliferation. J Neurosurg. 1961; 18:461-65. Keplinger JE, Bucy PC. Paraplegia from treatment with sclerosing agents-report a case. JAMA. 1960: 73:1333-36. Schneider RC, Williams JI, Liss L. Fatality after injection of sclerosing agent to precipitate fibro-osseous proliferation. JAMA. 1960; 170:1768-1772. Lawson AW. Acute esophageal variceal sclerotherapy. JAMA. 1986; 255:497-500.